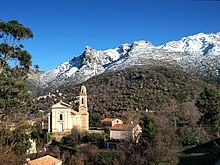 While being part of Metropolitan France, Corsica is also designated as a territorial collectivity (collectivité territoriale) by law. 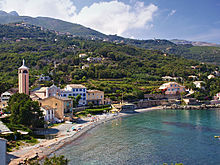 As a territorial collectivity, Corsica enjoys a greater degree of autonomy than other French regions; for example, the Corsican Assembly is able to exercise limited executive powers. 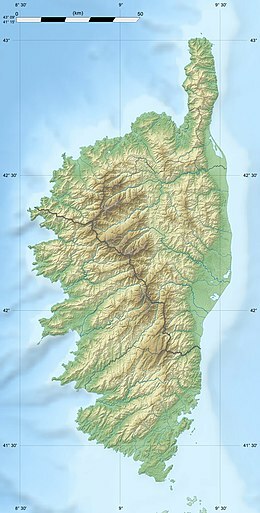 The island formed a single department until it was split in 1975 into two historical departments: Haute-Corse (Upper Corsica) and Corse-du-Sud (Southern Corsica), with its regional capital in Ajaccio, the prefecture city of Corse-du-Sud. Bastia, the prefecture city of Haute-Corse, is the second largest settlement in Corsica. The two departments, and the region of Corsica, merged again into a single territorial collectivity in 2018. After being ruled by the Republic of Genoa since 1284, Corsica was briefly an Italian-speaking independent republic from 1755, until it was officially ceded by the Republic of Genoa to Louis XV as part of a pledge for debts and conquered in 1769. Napoleon Bonaparte was born the same year in Ajaccio, and his ancestral home, Maison Bonaparte, is today a significant visitor attraction and museum. Due to Corsica's historical ties with the Italian peninsula, the island retains to this day many Italian cultural elements: the native tongue is recognized as a regional language by the French government. 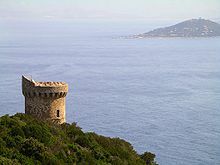 North African pirates frequently attacked Corsica, resulting in many Genoese towers being erected. Despite all that, during those years the Corsicans began to feel a stronger and stronger attraction to France. The reasons for that are manifold: the knowledge of the French language, which thanks to the mandatory primary school started to penetrate among the local youth, the high prestige of French culture, the awareness of being part of a big, powerful state, the possibility of well-paid jobs as civil servants, both in the island, in the mainland and in the colonies, the prospect of serving the French army during the wars for the conquest of the colonial empire, the introduction of steamboats, which reduced the travel time between mainland France from the island drastically, and — last but not least — Napoleon himself, whose existence alone constituted an indissoluble link between France and Corsica. Thanks to all these factors by around 1870 Corsica had landed in the French cultural world. From the 19th century into the mid-20th century, Corsicans also grew closer to the French nation through participation in the French Empire. Compared to much of Metropolitan France, Corsica was poor and many Corsicans emigrated. While Corsicans emigrated globally, especially to many South American countries, many chose to move within the French Empire which acted as a conduit for emigration and eventual return, as many young Corsican men could find better job opportunities in the far corners of the Empire where many other French hesitated to go. In many parts of the Empire, Corsicans were strongly represented, such as in Saigon where in 1926 12% of European were from Corsica. Across the French Empire, many Corsicans retained a sense of community by establishing organizations where they would meet regularly, keep one another informed of developments in Corsica, and come to one anothers’ aid in times of need. Corsica paid a high price for the French victory in the First World War: agriculture was disrupted by the years-long absence of almost all of the young workers, and the percentage of dead or wounded Corsicans in the conflict was double that of those from continental France. Moreover, the protectionist policies of the French government, started in the 1880s, had caused a significant strain on the Corsican export of wine and olive oil, and forced many young locals to emigrate both to mainland France and the Americas. As a reaction to these conditions, a nationalist movement was born in the 1920s around the newspaper A Muvra, proposing the island's autonomy; in the 1930s, however, the nationalist movement's key figures turned to Italian irredentism, seeing the annexation of the island to fascist Italy as the most desirable course of action. Under Benito Mussolini, the annexation of Corsica had become one of the main goals of Italy's domestic policy of expansion. Between the late fifties and the seventies, the project of building a nuclear polygon in the mines of Argentella, the immigration of 18,000 former settlers of the newly independent Algeria ("Pieds-Noirs") in the eastern plains, and continuing chemical pollution (Fanghi Rossi) from mainland Italy increased tensions between the local inhabitants and the French government. Tensions escalated until they eventually erupted in the occasion of an armed police assault on a pieds-noirs-owned wine cellar in Aleria, occupied by Corsican nationalists on 23 August 1975: Corsican nationalism has been a feature of the island's politics ever since, with several groups and nationalist parties active calling for the protection of the Corsican cultural heritage and greater autonomy, or even the restoration of the island's full independence. Some radical nationalists, organizing themselves in a group known as FLNC, carried out a violent conflict, which included a number of bombings and assassinations targeting buildings and officials of the French government, both from the mainland and Corsica itself. Periodic flare-ups of raids and killings culminated in the assassination of the Prefect Claude Érignac in 1998. It is 183 km (114 mi) long at longest, 83 km (52 mi) wide at widest, has 1,000 km (620 mi) of coastline, more than 200 beaches, and is very mountainous, with Monte Cinto as the highest peak at 2,706 m (8,878 ft) and around 120 other summits of more than 2,000 m (6,600 ft). Mountains comprise two-thirds of the island, forming a single chain. Forests make up 20% of the island. The island is 90 km (56 mi) from Tuscany in Italy and 170 km (110 mi) from the Côte d'Azur in France. It is separated from Sardinia to the south by the Strait of Bonifacio, which is a minimum of 11 km (6.8 mi) wide. The station of Sari-Solenzara records the highest year-round temperatures of Metropolitan France with an annual average of 16,41 °C over the 1981–2010 period. Sunshine hours are not available over this period but is 2715 h over 2008–2016. From 600 to 1,800 m (2,000 to 5,900 ft) is a temperate montane zone. The mountains are cooler and wetter, and home to the Corsican montane broadleaf and mixed forests ecoregion, which supports diverse forests of oak, pine, and broadleaf deciduous trees, with vegetation more typical of northern Europe. The population lives predominantly below 900 m (3,000 ft), with only shepherds and hikers at 600 to 900 m (2,000 to 3,000 ft). From 1,800 to 2,700 m (5,900 to 8,900 ft) is a high alpine zone. Vegetation is sparse. This zone is uninhabited. 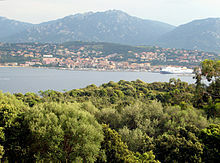 The island has a natural park (Parc Naturel Régional de Corse, Parcu di Corsica), which protects rare animal and plant species. The Park was created in 1972 and includes the Golfe de Porto, the Scandola Nature Reserve (a UNESCO World Heritage Site), and some of the highest mountains on the island. Scandola cannot be reached on foot, but people can gain access by boat from the village of Galéria and Porto (Ota). Two endangered subspecies of hoofed mammals, the European mouflon (Ovis orientalis musimon) and Corsican red deer (Cervus elaphus corsicanus) inhabit the park. The Corsican red deer was re-introduced after it was extinct due to over hunting. This Corsican subspecies was the same that survived on Sardinia, so it's endemic. There are other species endemic to Corsica especially in the upper mountain ranges, i.e. Corsican nuthatch, Corsican fire salamander and Corsican brook salamander and many plant subspecies. At the 2011 census, 56.3% of the inhabitants of Corsica had been born in Corsica, 28.6% were born in Continental France, 0.3% were from Overseas France, and 14.8% were natives of foreign countries. 2An immigrant is by French definition a person born in a foreign country and who did not have French citizenship at birth. Note that an immigrant may have acquired French citizenship since moving to France, but is still listed as an immigrant in French statistics. On the other hand, persons born in France with foreign citizenship (the children of immigrants) are not listed as immigrants. As in the rest of France, French is Corsica's official language and is now spoken throughout the island. 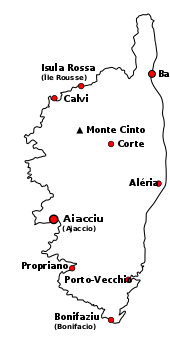 Italian was the official language of Corsica under the plurisecular Pisan and Genoese rule, and was retained as the island's administrative language until 1859. Corsican (corsu), an Italo-Dalmatian minority language that is closely related to Tuscan (toscano), has a better prospect of survival than most other French regional languages: Corsican is in fact, after French, the most widely spoken language on the island. However, Corsican lacks official status, and today it is estimated that only 10% of Corsica's population speak the language natively, with 50% having some sort of proficiency in it. The language is divided into the two main varieties of corsu supranacciu ("Northern Corsican") and corsu suttanacciu ("Southern Corsican"), spoken respectively northeast and southwest of the Girolata - Porto Vecchio line. This division was primarily due to the massive immigration from Tuscany which took place in Corsica during the lower Middle Ages: as a result, the supranacciu or cismontano became very similar to the Western Tuscan dialects, while the suttanacciu or oltramontano could keep more original characteristics which make this group of dialects relatively similar to a Southern Romance language like Sardinian (sardu). Therefore, due to the differences between the main dialectal varieties, most linguists classify Corsican as an Italo-Dalmatian language, while some others place it in the Southern Romance family, together with Sardinian. It should also be noted that fewer and fewer people speak a dialect of Ligurian, known as bunifazzinu, in what has long been a language island, Bonifacio, and in Ajaccio, the aghjaccinu dialect. 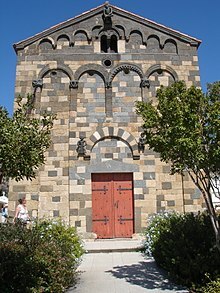 In Cargèse, a village established by Greek immigrants in the 17th century, Greek (ελληνικά) was the traditional language: whereas it has long disappeared from spoken conversation, ancient Greek is still the liturgical language and the village has many Greek Orthodox parishes. Looking north across the Strait of Bonifacio from the northern tip of Sardinia; the southern coast of Corsica is barely visible through the haze of distance. In 1972, the Italian company Montedison dumped toxic waste, which appeared to be red mud, off the Corsican coast, the most visible effects being cetaceans found dead on the shores. At that time the Corsican people felt that the French government did not support them. To stop the poisoning, one ship carrying toxic waste from Italy was bombed. 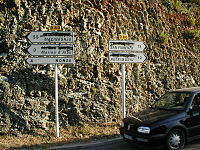 Corsican nationalists have used means such as the removal of French names (most of them of Italian origin) on road signs. On 17 December 2015, Jean Guy Talamoni was elected President of the Assembly of Corsica and Gilles Simeoni was elected Executive President of the Council of the Region. In addition, legislation granting Corsica a greater degree of autonomy was passed. ^ Ajaccio is the prefecture of the Corsican region. ^ "Corsica: The Mountain in the Sea". Retrieved 2018-11-16. ^ Pais, Ettore (1999). 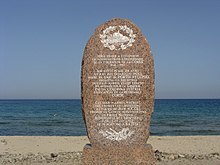 Storia della Sardegna e della Corsica durante il periodo romano (in Italian). Nuoro: Ilisso. pp. 76–77. ISBN 88-85098-92-4. ^ Howard, John E., Letters and Documents of Napoleon: Vol. 1 Rise to Power. New York: Oxford University Press, 1961. ^ Gregorovius, Ferdinand (1855). Wanderings in Corsica: its history and its heroes. p. 196. ^ Echo de la Corse (May–June 1929). "Inepuissable pepiniere de soldats et de coloniaux". Saigon-Cyrnos: Bulletin de l’Amicale Corse de la Cochinchine et du Cambodge. 43: 13–14. ^ Guelfi, A.D. (April 1931). "Les Corses hors de Corse partout presents toujours unis". Saigon-Cyrnos: Bulletin de l’Amicale Corse de la Cochinchine et du Cambodge. 58: 13–14. ^ Azéma, Jean-Pierre; Wieviorka, Olivier (1997). Vichy, 1940-44 (in French). Paris: Perrin. pp. 231–33. ^ Paletti, C. (1999). Un'operazione riuscita: Corsica settembre 1943 (in Italian). Rome: Ufficio Storico Stato maggiore Esercito. ^ "Jacques Massu obituary". Timesonline.co.uk. Retrieved 2012-10-27. ^ Mouillot, F. (2008). "Corsica". Mediterranean Island Landscapes: Natural and Cultural Approaches. Springer. pp. 223–225. ^ a b Price, Gillian. Walking on Corsica: Long-Distance and Short Walks. Cicerone Press Limited. p. 9. ISBN 1-85284-387-X. ^ Keyser, William (2005). "Corsican Villages and Towns" (PDF). Corsica Isula. Retrieved 29 April 2008. ^ Gregory, Desmond (1985). The ungovernable rock: a history of the Anglo-Corsican Kingdom and its role in Britain's Mediterranean strategy during the Revolutionary War, 1793–1797. London: Fairleigh Dickinson University Press. p. 16. ISBN 0-8386-3225-4. ^ Hogan, C. Michael (2009). N. Stromberg, ed. Hooded Crow: Corvus cornix – via GlobalTwitcher.com. ^ MacPhee, R.D.E. ; Hans-Dieter Sues (1999). Extinctions in Near Time: Causes, Contexts, and Consequences. Springer. p. 179. ISBN 0-306-46092-0. ^ "Estimation de population au 1er janvier, par région, sexe et grande classe d'âge – Année 2013" (in French). INSEE. Retrieved 2014-02-20. ^ a b "Fichier Données harmonisées des recensements de la population de 1968 à 2011" (in French). INSEE. Archived from the original on 25 October 2014. Retrieved 2014-10-25. ^ a b "IMG1B – Les immigrés par sexe, âge et pays de naissance" (in French). INSEE. Retrieved 2014-10-25. ^ "D_FD_IMG2 – Base France par départements – Lieux de naissance à l'étranger selon la nationalité" (in French). INSEE. Retrieved 2013-06-25. ^ "Euromosaic-Index1". uoc.edu. Open University of Catalonia. Retrieved 2012-10-27. ^ Bertoni, Giulio (1916). Italia dialettale (in Italian). Milano: Hoepli. ^ Devoto, Giacomo (1974). Il linguaggio d'Italia (in Italian). Milano: Rizzoli. ^ Nordhoff, Sebastian; Hammarström, Harald; Forkel, Robert; Haspelmath, Martin, eds. (2013). "Subfamily: Italo-Dalmatian". Glottolog 2.2. ^ Nicholas, Nick. "How Greek were the Greeks of Corsica?" (PDF). tlg.uci.edu. Thesaurus Linguae Graeceae. Archived from the original (PDF) on January 29, 2012. ^ "The Chestnut Tree". terracorsa.info. ^ Ward, Artemas (1911). "Bread". The Grocer's Encyclopedia – Encyclopedia of Foods and Beverages. New York. p. 76. Archived from the original on February 11, 2016. Retrieved October 10, 2018. ^ "The Region of Corsica". french-at-a-touch.com. Archived from the original on 23 March 2014. Retrieved 2014-03-23. ^ For a detailed description of the railroad system see Simms, Wilfrid S., "The Railways of Corsica" (1997)(ISBN 0952888122). ^ Blackwood, Robert J. (2008). The State, the Activists and the Islanders: Language Policy on Corsica. Springer. p. 164. ISBN 140208384X. ^ "France Moves to Crush Corsican Separatists". The New York Times. 15 January 1997. Retrieved 17 December 2012. ^ "Corsican". UNESCO Atlas of the World's Languages in Danger. UNESCO. 27 April 2011. Retrieved 24 November 2012. ^ "French Cabinet Split Over Corsican Autonomy". The New York Times. 30 August 2000. Retrieved 24 November 2012. ^ "A worrying result". The Economist. The Economist Newspaper Limited. 10 July 2003. Retrieved 24 November 2012. ^ "Victoire historique des nationalistes en Corse". abp.bzh. ^ "Corsican nationalists win historic victory in French elections". The Guardian. 14 December 2015 – via theguardian.com. ^ "Discours de Gilles Simeoni, président du conseil exécutif de Corse - France 3 Corse ViaStella". france3-regions.francetvinfo.fr. "Corsica" . Encyclopædia Britannica. 7 (11th ed.). 1911. pp. 199–204.